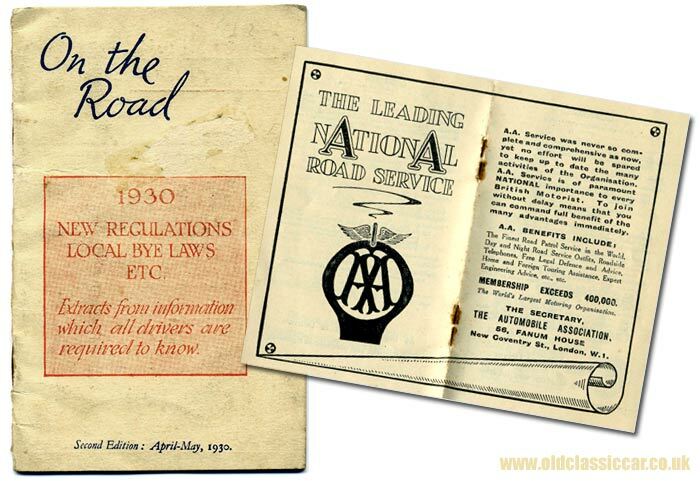 On The Road - motoring regulations and laws for 1930. Homepage. This page: Tips regarding local differences in motoring law around the UK in 1930. New Regulations & Local Bye Laws etc (1930). This pocket guide to motoring laws was published by the National "Safety First" Association of Victoria Street in London, with the approval of the AA, the RAC, and the Commercial Motor Users Association. It was a freely-distributed publication, sent to all local registration authorities, for inclusion with all newly-issued driving licences. The content was compiled by the General Secretary of the NSFA, a Lieutenant-Colonel J.A.A. Pickard, M.Inst.T.,M.I.A.E. The content covers two basic subject areas - updates to national motoring regulations, for example the introduction of a new type of road sign, and the vagaries of laws dreamt up by local registration authorities, enforced in addition to nationwide regulations, something that could easily catch out a motorist that regularly drove around the country as part of his or her job in 1930. "... a vehicle, when left at a parking place, should NOT have its doors locked up in such a manner as to render the vehicle incapable of movement by hand." Motorists in Oldham also had to be aware that a "... local bye-law forbids anybody to ride on, or be drawn by, any vehicle without the consent of the owner". Parking requirements with regard to leaving cars unlocked are also specified for Glasgow, although there is an additional note advising that this didn't apply in parking areas "... supervised by Earl Haig men" (?) I wonder what 1930's motorists would have made of the situation today, where cars have to be fitted with immobilisers, alarms, trackers and in some cases wheel clamps just to try and ensure that they won't be stolen? The increased adoption of automatic traffic signals (traffic lights) was also noted. By the end of 1929, signals - nearly all of the three-lamp pattern - were in operation in 50 or so towns and cities across the country. Notification signs, placed some distance ahead of the signals themselves, were also beginning to pop up, to a standard Ministry of Transport design. Interestingly, a footnote advises that some traffic signals, once the hours of darkness had fallen, may no longer display red and green lamps, simply leaving the amber lamp, flashing or static, presumably to allow traffic to flow at the drivers' discretion. Something like that might be a good idea today. Attention is drawn to a feature of roads in Manchester, where pedestrian-controlled "Safety Zones" were operating. These zones, protected by flashing lights, were also marked by metal studs positioned across the surface of the road. Motorists in Scotland were also faced with obeying certain regulations regarding trams. Key point to be aware of is that overtaking of a tram on the nearside, while the latter is stationary and passengers are boarding or alighting, is strictly forbidden. Playing noisy instruments whilst passing through villages. Throwing money to be scrambled for by children. Throwing out bottles or similar dangerous objects. Throwing out litter, fruit skins, liquids etc. Reversing too was frowned on in many areas, and the Motor Car Act "... forbids unjustifiable reversing, but in a few localities reversing in certain streets is specifically forbidden". Dudley receives a special mention, as reversing was completely outlawed on the High Street it says. London did not encourage the reversing of cars either, especially within a three-mile radius of Charing Cross station. A small number of advertisements are sprinkled throughout this diminutive handbook. A one-page advert promotes a Motor Log and Pocket Book on offer by the National "Safety First" Association, designed to enable a motorist to keep a log of expenditure on repairs, tyres, petrol and so on. All car owners and chauffeurs were also encouraged to sign up to "The Road Fellowship League", a campaign "... promoting chivalry on the road ...". A handsome dashboard mascot, as fitted to the H.R.H. The Duke of York's own motor-car, was also available to the keen motorist, the cost being 2s 6d. A full page ad for The Motor magazine appears inside the front cover, with attractions such as "Correspondence Columns - instructive, interesting, entertaining, sometimes amusing" and "semi-technical illustrations which the non-technical can comprehend at a glance" to be found within its pages. Avon tyres, Jubilee worm-drive clips, Castrol motor oil, R.O.P. Motor Oils and Petrols, and various insurance companies also feature.